10 A None No Power Seat 10 A is a standard Business Class seat, however, noise from the more crowded Economy cabin may be bothersome. 10 C None No Power Seat 10 C is a standard Business Class seat, however, noise from the more crowded Economy cabin may be bothersome. 10 D None No Power Seat 10 D is a standard Business Class seat, however, noise from the more crowded Economy cabin may be bothersome. 10 G None No Power Seat 10 G is a standard Business Class seat, however, noise from the more crowded Economy cabin may be bothersome. 10 H None No Power Seat 10 H is a standard Business Class seat, however, noise from the more crowded Economy cabin may be bothersome. 10 K None No Power Seat 10 K is a standard Business Class seat, however, noise from the more crowded Economy cabin may be bothersome. 22 A None No Power Seat 22 A is a standard Economy Class seat that has extra legroom, however, the position of the bassinet may be bothersome. 22 C None No Power Seat 22 C is a standard Economy Class seat that has extra legroom, however, the position of the bassinet may be bothersome. 22 H None No Power Seat 22 H is a standard Economy Class seat that has extra legroom, however, the position of the bassinet may be bothersome. 22 K None No Power Seat 22 K is a standard Economy Class seat that has extra legroom, however, the position of the bassinet may be bothersome. 23 D None No Power Seat 23 D is a standard Economy Class seat, however, the position of the bassinet may be bothersome. 23 E None No Power Seat 23 E is a standard Economy Class seat, however, the position of the bassinet may be bothersome. 23 F None No Power Seat 23 F is a standard Economy Class seat, however, the position of the bassinet may be bothersome. 23 G None No Power Seat 23 G is a standard Economy Class seat, however, the position of the bassinet may be bothersome. 29 A None No Power Seat 29 A may have limited recline. The proximity to the lavatories may be bothersome. 29 C None No Power Seat 29 C may have limited recline. The proximity to the lavatories may be bothersome. 29 D None No Power Seat 29 D may have limited recline. The proximity to the lavatories may be bothersome. 29 E None No Power Seat 29 E may have limited recline. The proximity to the lavatories may be bothersome. 29 F None No Power Seat 29 F may have limited recline. The proximity to the lavatories may be bothersome. 29 G None No Power Seat 29 G may have limited recline. The proximity to the lavatories may be bothersome. 29 H None No Power Seat 29 H may have limited recline. The proximity to the lavatories may be bothersome. 29 K None No Power Seat 29 K may have limited recline. The proximity to the lavatories may be bothersome. 3 A None No Power Seat 3 A is a standard Business Class seat, however, the proximity to the lavatory may be bothersome. 3 C None No Power Seat 3 C is a standard Business Class seat, however, the proximity to the lavatory may be bothersome. 3 H None No Power Seat 3 H is a standard Business Class seat, however, the proximity to the lavatory may be bothersome. 3 K None No Power Seat 3 K is a standard Business Class seat, however, the proximity to the lavatory may be bothersome. 45 A None No Power Seat 45 A is a standard Economy Class exit row seat that has extra legroom. The proximity to the lavatories and galley may be bothersome. 45 C None No Power Seat 45 C is a standard Economy Class exit row seat that has extra legroom. The proximity to the lavatories and galley may be bothersome. 45 H None No Power Seat 45 H is a standard Economy Class exit row seat that has extra legroom. The proximity to the lavatories and galley may be bothersome. 45 K None No Power Seat 45 K is a standard Economy Class exit row seat that has extra legroom. The proximity to the lavatories and galley may be bothersome. 46 D None No Power Seat 46 D is a standard Economy Class seat that has restricted legroom. The position of the bassinet may be bothersome. 46 E None No Power Seat 46 E is a standard Economy Class seat that has restricted legroom. The position of the bassinet may be bothersome. 46 F None No Power Seat 46 F is a standard Economy Class seat that has restricted legroom. The position of the bassinet may be bothersome. 46 G None No Power Seat 46 G is a standard Economy Class seat that has restricted legroom. The position of the bassinet may be bothersome. 52 A None No Power Seat 52 A is missing a window. 52 K None No Power Seat 52 K is missing a window. 53 A None No Power Seat 53 A is a standard Economy Class seat, however, this seat has an immovable armrest slightly reducing the seat width. 53 C None No Power Seat 53 C is a standard Economy Class seat, however, this seat has an immovable armrest slightly reducing the seat width. 55 A None No Power Seat 55 A may have limited recline. The proximity to the gallies may be bothersome. 55 C None No Power Seat 55 C may have limited recline. The proximity to the gallies may be bothersome. 55 D None No Power Seat 55 D may have limited recline. The proximity to the gallies may be bothersome. 55 E None No Power Seat 55 E may have limited recline. The proximity to the gallies may be bothersome. 55 F None No Power Seat 55 F may have limited recline. The proximity to the gallies may be bothersome. 55 G None No Power Seat 55 G may have limited recline. The proximity to the gallies may be bothersome. 55 H None No Power Seat 55 H may have limited recline. The proximity to the gallies may be bothersome. 55 K None No Power Seat 55 K may have limited recline. The proximity to the gallies may be bothersome. 7 A None No Power Seat 7 A is a standard Business Class seat that has extra legroom, however, the position of the bassinet may be bothersome. 7 C None No Power Seat 7 C is a standard Business Class seat that has extra legroom, however, the position of the bassinet may be bothersome. 7 D None No Power Seat 7 D is a standard Business Class seat that has extra legroom, however, the position of the bassinet may be bothersome. 7 G None No Power Seat 7 G is a standard Business Class seat that has extra legroom, however, the position of the bassinet may be bothersome. 7 H None No Power Seat 7 H is a standard Business Class seat that has extra legroom, however, the position of the bassinet may be bothersome. 7 K None No Power Seat 7 K is a standard Business Class seat that has extra legroom, however, the position of the bassinet may be bothersome. Japan Airlines offers everything from the latest pop tunes to traditional Japanese comic monologues (rakugo) OnDemand. Business class passengers receive Panasonic noise-canceling headphones on routes between Tokyo and London, Frankfurt, Paris, New York (except on JL048/047), Chicago, San Francisco, and Los Angeles. Each seat has the MAGIC in-seat entertainment system with movies, games, and audio programming as well as Audio Video OnDemand (AVOD). All seats feature 110V AC power ports. Additionally, all seats on this aircraft are outfitted with USB ports. JAL is rapidly providing in-flight Wi-Fi connection service on their aircraft. You may connect by using your own smartphone, tablet, or other wireless LAN device. Service for internet access is fee based. Free entertainment streaming is available on Japan domestic flights. Additional information regarding WiFi connection service, rates, and routes where service is available may be found by clicking here for domestic Japan flights or clicking here for international flights. On flights to/from Europe and North America, Japan Airlines offers its Sky Oasis service, a self-service snack and beverage buffet as well as complimentary meals in both economy and business class. 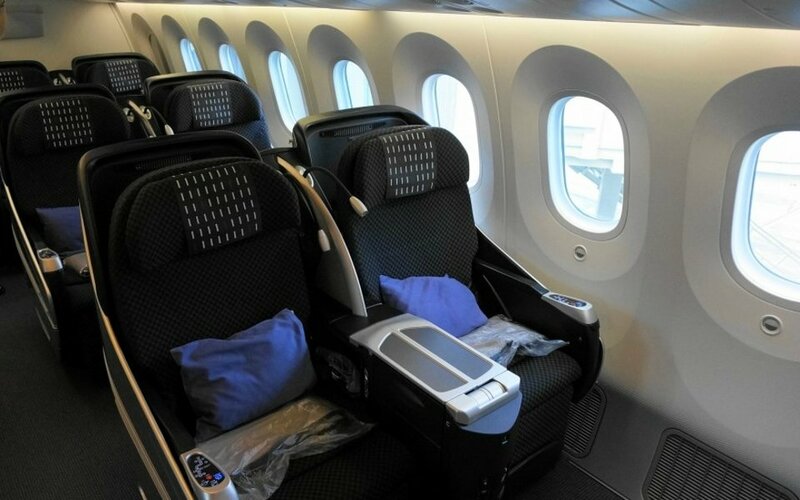 This Boeing 787-800 (788) seats 186 passengers and is primarily used on International routes. Japan Airlines is the first airline to operate the Boeing 787-800 Dreamliner service to and from North America. The cabin has been updated with the latest features and amenities including larger overhead bins and windows, dimmable shades, higher ceilings, lower cabin pressure, personal ventilation air vents above each seat, Audio Video on Demand with large touch screen LCD's, Sky Bar, and LED mood lighting throughout the aircraft. Lots of legroom but a cocoon style shell angle flat seat which is hard to sleep in. By contrast the 767 has a much nicer lay flat design. What were they thinking? The angle "lie flat" is very uncomfortable. One continually slides down. Impossible to sleep. You should color these red. THERE IS NO OVERHEAD STORAGE SPACE WHATSOEVER FOR THIS SEAT OR 1D. Leaves you to fight with passengers in AB and HJ for some overhead space. Although seat 55 is not regarded as preferable. I love it! Its out of the way and aoart from staff nonody walks by . Seat does recline . Your at the back near galley but its very quiet JAL staff are so respectful and quiet. Its not near washrooms which is hreat by me! I like the configuration of seats on dreamliner as well as lighting. One thing i do not like is having no slider to pull down on window. The dimmer does not dim enough if the sun is directly shining in. Its like looking fully at sun through sunglasses. Its extremely annoying. For all its supposed technological innovation, in economy class at least, the "Dreamliner" experience is normally pretty miserable. Most airlines pack 9 seats across, meaning it's more like a low cost cattle truck than anything "dreamy". JApan Airlines bucks the trend, with a 2-4-2 configuration. This makes it much more comfortable. Add in that they serve a proper meal even short haul ( I took a c. 3hr Taipei Tokyo fkight), and my feeling is Japan is one of the last bastions of relatively civilised flying outside the premiem cabins. Horrible. Flying this 787 from KIX-LAX the amount of legroom you get resembled something of a standard domestic US flight. Flew JL61/LAX-NRT prior to this on 777 and I had enough legroom to cross my legs (I'm 5'8", 173cm) but not this plane. It's very tight and very uncomfortable for an 11.5hr flight. Avoid this 787 if you can and go with the 777. Dreamliner was a major let down. 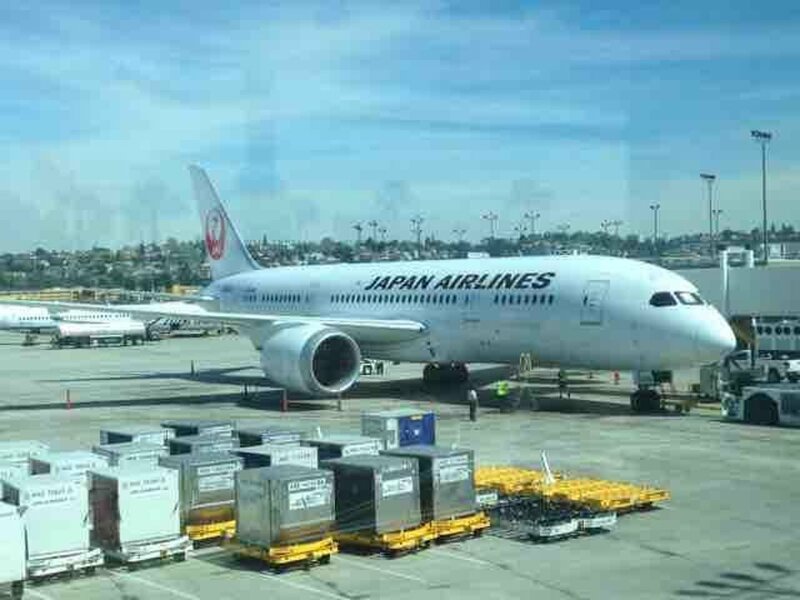 We took JAL61 LAX to Tokyo outbound (777-300ER), then JAL60 KIX to LAX on our return. The seat was uncomfortable. Barely any cushion on the seats which makes it really hard to sit on for 12 hours. The seat pitch significantly decreased compared to our comfortable outbound flight on the 777-300ER. Monitor was hard to look at since it was too close to my eyes. (for reference, I'm 5' tall petite female). They do have fold down foot rests, which most Japanese airlines USED to have, but not on 777-300ER. However, these seats are so crammed that even at 5' tall, these foot rests are useless. I liked the 2-4-2 seat configuration, however, since I was traveling with my son. The MAJOR fail, imo, was the dimming window shields- which dims, but does not block lights. This was a night time flight, but the bright lights from the wings were in my eyes the whole flight, which made it very difficult to sleep. The ONLY thing I liked about this fleet was the bathrooms. The bathrooms were pretty roomy. One bathroom actually had enough space to fit two people, which made it very easy for me to help my son when he needed to use the laboratory. However, I would stay away from this fleet from now on, even if that means that I'll have to take a detour via Tokyo whenever I visit my family in Japan. USB ports on the seat back does NOT charge iPads (at least the newest version), it does charge iPhones. It did NOT have AC power plugs. This configuration in economy is a major fail for JAL. The seat width and pitch is not adequate for the 11.5-hour flight from San Diego to Narita. I suffered as an average-size female with an empty seat to my left and my average-size husband to my right. It's almost tolerable for the 9.5-hour flight from Narita to San Diego. I always enjoy Japan Airline's superb service, both on and off the aircraft. I always fly JL017/18 between Vancouver and Narita, and despite the fantastic service, I am always disappointed with their "Flat Shell Neo" business seats. They are uncomfortable to sleep as it is not a pure "flat-bed", and older and overall not the quality you expect compared to their other "Sky Suite" series flat-bed seats. I sure hope they will update these seats very soon; until then, I will be using my miles to upgrade as it is not worth the price you pay for. I think 7A is one of the best business class seats on this plane. It has extra legroom and being a bulkhead has easy access to the aisle (with other business seats on this plane you do have to climb out). The proximity to the galley is not bothersome at all. Service is great, food is very good. The only downside is that these seats are not good for sleeping. They angle and are not as long as you'd hope. Also I would caution against seat 7B , because it is right next to the galley and curtain and that does get annoying during a long flight. I fly JL 65 & 66 a couple times a year and their Business Class seats are really not comfortable. The seats only has a 60 degree pitch and sloped sides. Not much "dreaming" going on on their Dreamliner! I'm booking a ticket for my next trip and I'm seriously considering another airline that has lie flat seats even if it means having to go through LAX. Business class seats are a total FAIL on this aircraft. As someone who is 6'5" tall, I had to sleep sideways and curled up, and even then I kept sliding down the seat which is at a steep pitch when in "flat bed" mode. If I sat up to sleep, the backrest hit me at mid-back, and it was barely adjustable. It felt like my back was up against the steel bar in an old sofa bed. This is the only time I wish I had an economy seat instead of a Business Class seat. Why did they install these terrible old-style seats on a brand new plane? Fly a different aircraft if you can, else don't waste your money on Business Class. Service in JAL's "version one" of the 787-8 is a mystifying fail. The business class seat is a variant on what was state of the art ten+ years ago. Shell, angle-lie flat, narrow arm rests, no storage to speak of, no privacy from your neighbors whatever. The leg rests were barely dimensioned to fit me at 5'10", I can't imagine a taller person dealing with this well. No premium economy offered. Meal service and amenities badly lackly. Compare this to "version two" -- currently in use JFK-NRT and perhaps other routes. It features the all-direct access SkySuite in a 2x2x2 format, very simliar to the 777-300ER SkySuite done in a 2x3x2 format. Semi-private, full lie flat with a VERY generous foot well (beats CX, AA and BA there) and a very nice Premium Economy seat. the legroom on these seats were great. we however didn't like the smell inside the plane. it was like the smell of the bathroom! we travelled with an infant and these seats were great and has good legroom! Not bad, but at 6'0" (183cm), think I might next opt to be behind a seat. When flying economy I sleep at least some of the time with legs crossed. This position is made easier with a seat to prop against. Seat 45K (and A, I would assume) do have a small bump-out from the emergency exit, but my legs were a few inches too long to catch it for comfortable left over right leg-crossing. On a separate note, service on my NRT-JFK flight was attentive and kind. I had fallen asleep during the main meal service and nearly as soon as I awoke, an attendant asked if I would like to eat. I wasn't offered a choice, but mere minutes later she returned with a full vegan or vegetarian meal - and reheated main course - plus a bottle of water. A very thoughtful gesture and one which left a good impression. Arigato, Japan Air! This seat was perfect for me, a very tall man in need of leg room. Overall, this 787 is a great leap forward in passenger comfort. Particularly impressive are the large toilets and the huge windows with electronic shading. JAL service on this flight was superb. The best Economy-level flight experience I have ever encountered in many years of business travel. I flew from Tokyo to Helsinki, and it was the most comfortable flight I have ever had in economy class. JAL recently changed the configuration from nine seats across to eight, making each seat a little wider in the process. It is definitely noticeable. I also found there to be as much legroom as in economy plus on United, with far better service. Definitely check if your flight is operated by a JAL Sky Wider aircraft, as it will make a world of difference. I just flew on JAL 066 787-8 v1. For all non japanese citizens. Try your very best to use another airline. I have absolutely never added a comment on here. I fly all over the world and several times a year. Issues started a ticket counter. Yes, i am an american that can speak japanese very well and live and work in Japan. The young lady at the check-in counter kept telling me over and over you do not have a reserved seat. I showed her my confirmation. She said i am sorry the airline gave you this and i will check once again. She came back and said i am sorry and we will be having you assigned to seat 53 E. I said very nicely with a smile ok. But this is not very good customer service and your booking process gets a failing grade. So, the flight. I walk past my previously confirmed seat and their was a Japanese younger man with his hat cocked side ways. I said got it, they gave my seat away. So, back to flight. The on demand movies and audio is probably one of the best out there. As far as the seats, i would like to say to JAL. I am very sorry that BOEING USA ripped you off on the purchase of these planes. The seats are the worst i have ever experienced. EVER! I am 5'8" and weigh 179 lbs I am in very good shape and run every day. I landed in San Diego and felt a pain in my left ankle. I had to curl my left leg under the seat in front to get comfotable during the flight. My back ached the entire flight. After landing as i received luggage and checked my leg. My entire leg and ankle was swollen. When i say swollen. It got worst through out the day and night. I will tell you the five others traveling on business with me had same issues with getting comfortable during flight. We were all excited to fly this plane 787. I will tell you that all of us are seriously dreading this flight back to Japan. Two of co workers have changed flights and airline. A major let down as well in cabin service was nothing more than average. I would give JAL 3.5 on skytrax.A beautiful aircraft to look at from the outside. But a very painful flight in economy class and business class would be a waist of your money. Its better, not by much. Be smart book "DO NOT FLY" on a 787 or this airline. The seats are designed for very small people. The plane and service was great. The angle-flat seat was not. How could they put a last-gen seat setup on a next-gen plane? While seat 7H does have leg room, the seat interferes with the aisle and divider curtain when reclined so that you get woken up (if you can sleep at all at an angle) every time someone passes by. This should be a "avoid" seat and so should 7C. The other seats in row 7 are good. These seats are very good,but I might add there is no floor storage for carry on's. For landing and take off' everything must be put in the storage bins. Seats 49H and 49K had limited storage space underneath the seats in front due to electrical boxes located underneath the seats of 50H and 50K. It was difficult to stow two briefcases, my seatmate needed to put his in the overhead bin. First and foremost, the service was impeccable. Now that being said, I was literally trapped up against a window without any of turning. The seat pitch "feels" as though it is smaller than the norm. If the purchase in front of you reclines, you are doomed, not to mention the entertainment system that is mere inches from your face resulting in my eyes' inability to actually focus on the screen. The high ceilings are a nice touch. All 787 window seats, my 3rd time on this plane! I sat for 12 hours with the sun on my side. With no window blind the window became so hot, you could not touch it, it was the worst flight I have ever had - it was like having a radiator fixed next to my head. I will avoid at all costs such an experience again. If not I will try to make sure I have something to cover the window with. I have a thin strip thermometer with me so I know if in such a situation I am not talking rubbish. The width of Y class seat is 18.5-18.9 inches. Very wide seat! I always flew Japan airlines. I was never happy with seats in business class even before 787. Used to fly on board 767. I was happy to hear Japan airlines introducing 787 between Vancouver and narita. I was first to try it last year and I was extremely disappointed with the business class seats. Could not sleep a bit. After that experience I have decided to try other airlines. So far so good with CX. I hope Japan airlines can do something about this as I enjoy the food. 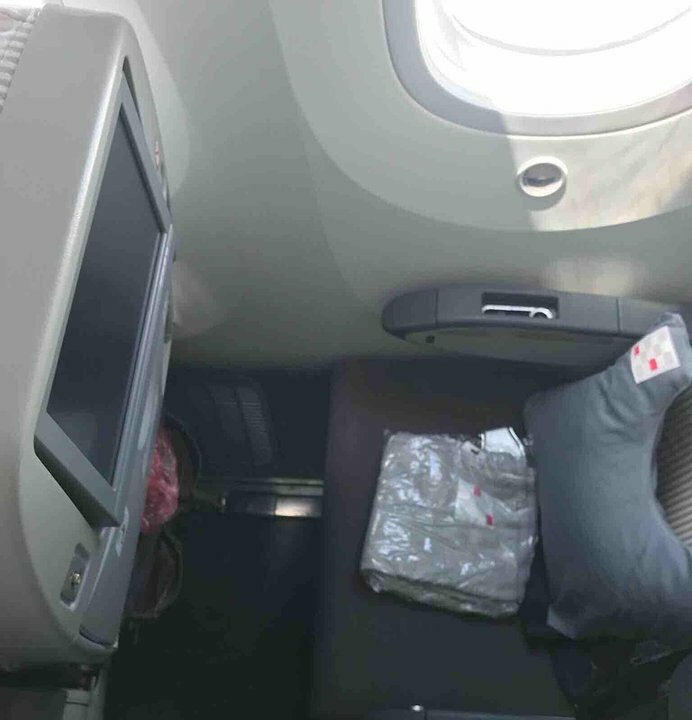 I transferred from JL 61 (777 from LAX to NRT in business) and was expecting the same great business seats. Wrong! Agree with previous post that the business seats on the JAL 787 are the most uncomfortable I have ever seen - even worse than the old AA business seats, and they were very bad. Angle seats, too short for anyone over 6 foot, narrow with hard surfaces everywhere. Who ever approved this seat at JAL should commit Seppaku so that the airline politics are done with and JAL can then replace them with new lie flat seats. The most extraordinary thing is that the new business seat on the 777er is very good. What were they thinking???? Thought I might be interested in booking a flight from SAN to NRT. But I can't see any views of the first class/business class 788 seats on the web site. May be interested, but the information does not seem to be there. The economy class was amazing (i was om the brand new reconfigured plane) the service in economy was outstanding the food is delicious in economy the one thing i think is that they need a little bit more english programming. The seat was reasonably comfortable, the nooks and crannies were appreciated. For long haul flights the expectation is that most are asleep, but for those like me that can't sleep on planes, the entertainment was also decent. The one drawback for me is that if in the window seat and the aisle seat person is asleep, then it is difficult to pass if they are flat out. I can't believe that JL has put such exceedingly poor business class seats on their Dreamliner. 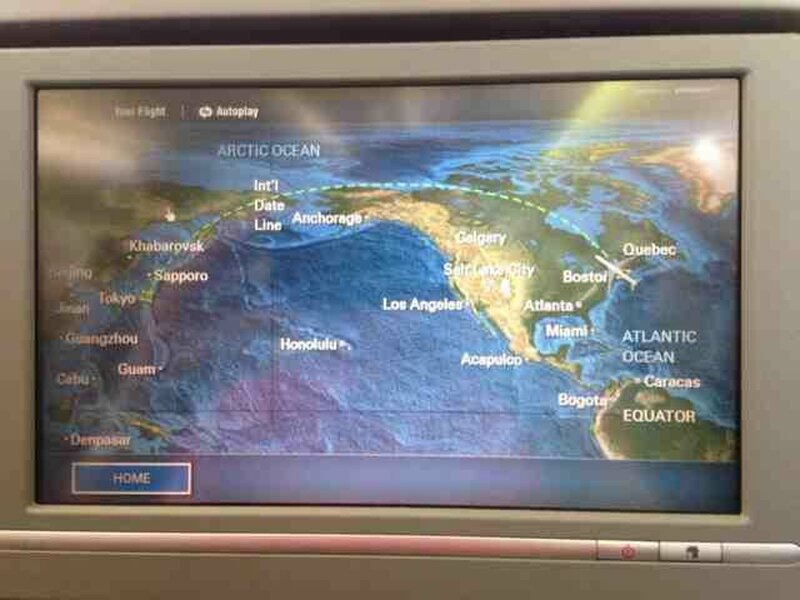 Even AA's woeful 777 seats to NRT/HND are being replaced with full lie-flat versions. I have already booked my next flights to BKK on CX's new BOS-HKG service- I know they have proper lie-flat seats in business. Sorry JL, but you aren't going to get my ~4 business class RT tickets BOS-BKKany more. Without doubt Japan Airlines has LOWERED the bar on buisness class. I am not a large person being a standard Medium. The seats are extrmeely narrow (elbow war with the passenger next door), the seats are hard and extremely uncomfortable, a tiny TV Screen, and not even lie flat. JAL you are a ripp off. Having jusy boarded i was immediately looking for a way to escape. The flight to Tokyo from Narita is going to be extremely long and uncomfortable. My advice to anyobe readjng this. Avoid JAL and seek another airline. One that values you as a consumer and one who wants you back! JAL nonway again. This is one of the worst planes I have been on in a while. On the way to Tokyo we had the 777 (seated in economy as well), and it was much more roomy - it was actually a pleasant experience and we were looking forward to the flight back. However the dreamliner was very cramped, there was a large metal box under the seats in front of us restricting legroom, my knees touched the seat in front of me (before the person in front reclined), there was no wifi, and the entertainment system seemed antiquated for a new plane. Higher ceilings are great, but not much help when you are busy trying to find the right angle for your legs. 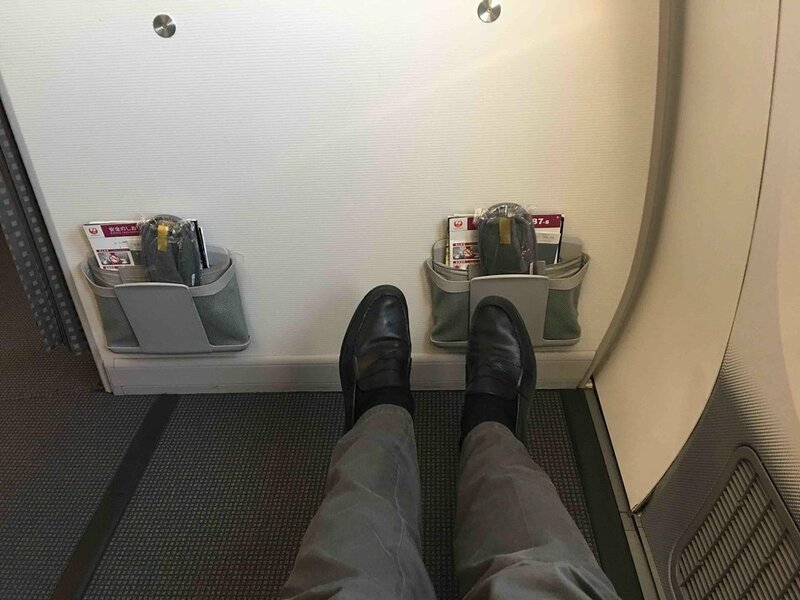 I did not find the legroom to be restricted in 1K. Certainly up to par with other business class seats. However, the overall JAL business class experience was disappointing. Not to have fully lie flat seats on a brand new aircraft is in my opinion a big error - especially since they are upgrading other older aircraft in their fleet with the lie flat beds. The service was only mediocre. Staff was friendly, but not very attentative. No drinks served while plane was being boarded, the offered hot towels were cold. It took very long to clean the cabin after the meal service - the "hot" towel from after take off was still on my tray 3 hours into the flight. It's certainly complaining on a high level, but other airlines exceed in their business class service by worlds - and in a competitive world this will give others the edge. Apart from the the 787 is a beautiful aircraft and the new windows are fantastic! Flying economy on the JAL 787 is tough, 31 inch seats make 12 hours to Tokyo a challenge. I was fortunate to have seat 23D, a bulkhead seat, thanks to a kind gate agent. Lots of legroom there, worth the extra traffic going into the lavatory area. The return on a JAL 767 was much nicer thanks to the 34 inch seats. a HUGE disappointment especially since JAL put a 18:30 flt to JFK which is perfect for many connections that fell apart after AA xld their flight. Virtually impossible to sleep or get comfortable in the ancient Shell Seats (improved lie flats promised for end of 2014). Super-small pillow,one size of flight sweater (VERY SMALL) - AVOD is very limited if you are not Japanese - Food is OK but took 1H10M to get my first drink -Service was also "iffy"- only 2 lavs for 60 pax - front lav was "off limits"
787 is narrower than 777 and the seats are not more comfortable. The seating arrangement of JL is not as accommodating as other airlines flying 787: 2-2-2 instead of more imaginative designs of ANA or Qatar. Movie selections and choice of meal for Boston-Narita are improving.Doting staff on and off board. This plane is a fantastic machine. The overall environment in the plane is a tremendous improvement. San Diego to Tokyo Business Class food, service and entertainment is very good. However, the lack of complete lie flat seating does not make sense for a new generation aircraft such as this. I flew one short leg on a JAL 777 outfitted with the lie flat suite and the difference in comfort is significant. JAL needs to upgrade the seats in business class on this aircraft. Very fortunate to have the bulkhead for the San Diego to Tokyo flight. Good legroom here, the regular coach seats are poor on legroom throughout. 31 inch pitch coach seats for a 12 hour flight is inhumane. Buyer beware. The middle armrest between 53A and 53C does not raise. The FAs mentioned that there are some A/C and H/K seats scattered throughout the plane that don't allow the middle armrest to be lifted. I would recommend avoiding those for couples or if you're purchasing two seats to give yourself more room. The JAL Economy seat pitch of 31 inch is very tight and uncomfortable even for a shorter flight of 6+plus hours. I am medium built at less than 6 feet tall and still find it a struggle. Nice Plane, Nice seat, Good Food, Very Good Service. Only drawback- it is the newest plane in inventory. BUT Upper Class is not LIE FLAT. I think this is really a FAILURE. Japan Airlines flies 3 versions of Boeing 787-800.